The Cod Beck flows through the market town of Thirsk in North Yorkshire. Its name means the small river that flows by the wood (coed in old English). 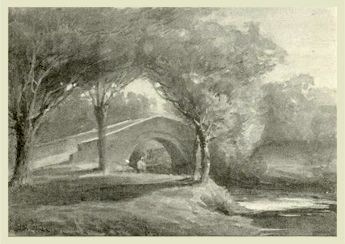 The drawing is of the old pack-horse bridge in Sowerby, the southern part of Thirsk. Frank spent many happy years growing up in Thirsk, and hours upon hours by the Cod Beck. It is a delightful leafy green scene today. The bridge was built of sandstone in 1672 with a massive grant at the time of £20. It was part of the pack horse transport network which carried goods all over England. This bridge was a key river crossing on the old Drovers' Road along the base of the Hambleton Hills and replaced a nearby ford. The bridge is fairly narrow (5 feet wide) and has low parapets so that the packs on the horses had clearance. There used to be a pub nearby to quench the thirst of the drovers whilst the horses were watered. Sadly the pub is no more and the pack horses have been replaced by articulated lorries on the A19 trunk road close by. Times may have moved on, but the great memories of the Cod Beck in the 1950s and 60s still linger.